You know how it is: you desperately need to set something on fire—but oh no!—everything on your person is soaking wet. Well, that’s probably why you need the fire. Anyway, if you’re equipped with a waterproof fire kit ($150), you’re set. 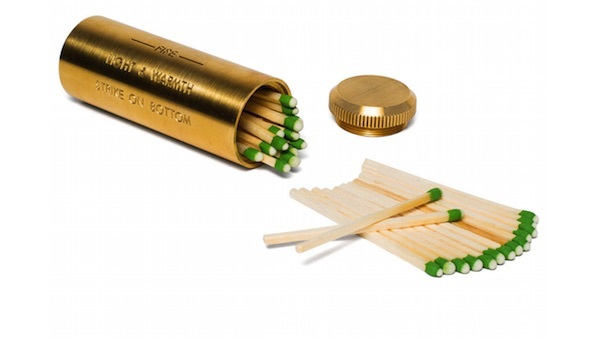 It’s essentially a solid, single piece of brass machined out to hold matches and a cotton ball (for tinder). The bottom is rough, so you have a place to strike matches, and the top screws on tightly, which keeps out the water. All in all, a good and self-contained system.